Porter’s Athletic Performance offers an affordable small group option for middle school and high school developmental athletes that is available on Monday - Friday with sessions starting at 3:30pm and 4:30pm, lasting approximately one hour. Our program allows youth athletes to develop strength, endurance, speed, power, and flexibility. These sessions never exceed a ratio of 10:1 athletes to coaches, providing an intimate coaching experience for each individual athlete. Within each individual’s program they will be pre- and post-assessed through a variety of different power metrics (i.e. vertical jump, broad jump, 5-10-5, and 40 yard dash) to consistently measure their athletic development throughout our program. We understand the importance of individualized programs and that each sport/position requires different movement skills, strength/power profiles, energy systems, and levels of recovery. We also understand that each season of an athlete’s year requires different volumes, intensities, and loads, which is why we have different programs for an athlete’s pre-season, in-season, post-season, and off-season to optimize their development and reduce their risk of injury within each respective season. Throughout the year we offer programs of one, two, three, four, and five days a week, depending on the individual athlete’s needs and which season they are in at that time. For example, an athlete in their pre-season will likely focus on power/strength and energy systems development and may train three-five days a week while an athlete in season will primarily focus on maintenance and recovery before next competition and may train one-three days a week. No matter where your athlete is in their career, which season they are in, or what position they play, we can offer a program that is specific to their needs/goals to optimize their individual performance on the field and decrease their risk of injury, keeping them healthy and playing the sport they love. Porter’s Athletic Performance offers a team training option for groups of 10 participants or greater. The team training option allows youth athletes the ability to develop strength, endurance, speed, power, and flexibility. Team training will take place based on availability of schedule and a mutually agreed upon time between the team and Porter’s Athletic Performance. These sessions never exceed a ratio of 10:1 athletes to coaches, providing an intimate coaching experience for each individual athlete. Within each individual’s program they will be pre- and post-assessed through a variety of different power metrics (i.e. vertical jump, broad jump, 5-10-5, and 40 yard dash) to consistently measure their athletic development throughout our program. The team training option’s programming is based on the gross need/goals of the team as is relayed by the coach of the team to the specialist assigned to the group. The primary benefit to the team training is that the entire team is on the same schedule and can therefore be periodized to peak at the time of competition. Strength and conditioning for a team is also excellent from a comradery perspective and allows for the team to spend time with each other away from their respective coach trying to achieve collective goals away from their sport, but still directly aid in achievements within that sport. We have had great success in our team training programs. One team in particular (AFSC 1999 girls) won five Arizona State Championships in a row, four of which were won while training with Porter’s Athletic Performance. From that team seven girls are now playing in Division I or II soccer programs (including ASU (2), NAU (3), Regis College (1), and Western Oregon (1)) and five of them are starting as freshmen, showing how this type of training can have a massive impact on an athlete’s ability to instantly compete at the next level. Additionally, from that team every single player is attending college on an athletic scholarship, academic scholarship, or both, drawing a strong correlation from success in sports to success in academics. Please email Kyle at kyle@portersathleticperformance.com for all pricing information. Porter’s Athletic Performance offers private training on a one on one basis and is the ultimate individualized program. Each program is based on the individual goals and needs of our athletes. We offer a holistic functional approach that allows our athletes to feel challenged in a competitive environment while developing the attributes that they need most to succeed in their respective sport. Each of our strength and conditioning coaches has collegiate athletic experience and/or professional athletic experience and are college educated with a multitude of certifications specific to sports performance, ensuring the highest level of training and professionalism for your youth athlete to excel in their sport. Each private client is pre- and post-assessed, first going through a Functional Movement Screen to identify any dysfunction that could potentially lead to injury. If any dysfunctions or muscular imbalances are identified the individual is given injury prevention protocol to correct these imbalances through their program. They are also tested in several power metrics (i.e. vertical jump, broad jump, 5-10-5, and 40 yard dash) to consistently measure their athletic development throughout our program as they are periodically retested to compare results. This also allows for our strength and conditioning coaches to alter their program to garner the best results possible, optimizing the individual athlete’s performance and minimizing their injury. We have had great success through our private training. One individual in particular is former MLS champion goalkeeper (Portland Timbers), Andrew Weber. Andrew was trained by owner and head strength and conditioning coach Kyle Porter in his off-season, pre-season, in-season, and post-season of last years NPSL season with FC Arizona. Through the season Andrew had thirteen shutouts, won the Western-Conference Title, received the award of First-Team All Western Conference, First-Team All NPSL, and also received the “Golden Gloves” award. Private training is scheduled by appointment only. For more information email kyle@portersathleticperformance.com. Porter’s Athletic Performance offers field training for groups of ten athletes or greater. Similar to the team training option; however, outside, the field training option allows youth, college, or professional athletes the ability to develop strength, endurance, speed, power, and flexibility. Field training is scheduled by appointment only. These sessions never exceed a ratio of 20:1 athletes to coaches. The field training option’s programming is completely movement skill based, but also includes mobility, flexibility, strength/power, plyometric, and energy systems development aspects. The program is based on team needs/goals as is relayed by the coach of the team or club to the specialist assigned to the group. The primary benefit of field training is that we come to you while still offering all of the same benefits of team training (highlighted above). We have had great success in our team field training working with clubs such as FC Arizona (2017-present), Phoenix Premier FC (2016-present), and Ahwatukee Foothills Soccer Club (2013-2017). One team in particular is the NPSL Western Conference Champions - FC Arizona. 2017 was the inaugural season for FC Arizona in the National Premier Soccer League and won the Western Conference Championship with a record of 14-1-4, going undefeated in the regular season. The team trained with owner and head strength and conditioning coach Kyle Porter through their pre-season, in-season, and post-season. Their head coach Aidan Davison said “Kyle worked with FC Arizona for our inaugural season in 2017. His work was outstanding and there is no doubt in my mind that his quality of work was vital in our season’s success.” Additionally, from that team three players made the NPSL West Best XI, one named NPSL Second-Team, one named NPSL First-Team, and the recipient of the 2017 Golden Gloves Award (Andrew Weber). Other Porter’s Athletic Performance field training clients have included Phoenix Premier Football Club (2016-present) and Ahwatukee Foothills Soccer Club (2013-2017). What does it mean to move well? Many strength and conditioning coaches talk about it and many of them spend their time guessing what should be done to increase the quality of an athlete’s movement. Well, here at Porter’s Athletic Performance we do not take such chances and we eliminate the guessing game telling you what quality movement really is by using a Functional Movement Screen. Our strength and conditioning staff is certified in FMS so that we can better understand the starting point of our athletes to optimize their training plans to garner the results they most desire in the safest way possible. The Functional Movement Screen measures seven fundamental movements that are key to daily life and sport. It scores individuals in a simple way to determine if their movement patterns are optimal, acceptable or dysfunctional. 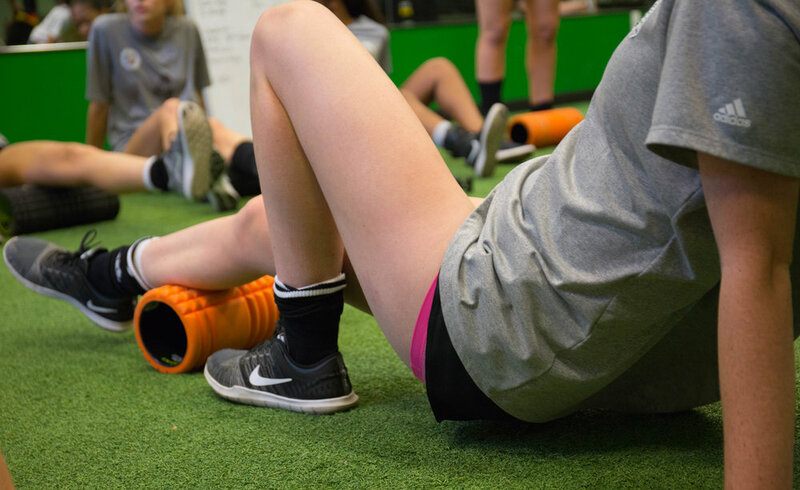 Once an individual has gone through the test and the seven areas are deemed optimal, acceptable, or dysfunctional our training staff uses this information to create an injury prevention protocol that the athlete will complete prior to every session with us. Additionally, if an area is dysfunctional it also indicates if an athlete needs to see a doctor prior to starting a program with us. By identifying these potential problem areas we can better understand where to start your athlete thereby improving their quality of movement, optimizing their performance, and minimizing their risk of injury. FMS tests are scheduled by appointment only and are only included without fee in our private training program. Once an FMS test is purchased that athlete will receive one free FMS test per year for the rest of their time as our client. To schedule your athlete’s FMS test today contact kyle@portersathleticperformance.com. Functional Movement Screening: $80, but included in the private training option.